This puzzle is built on a 4 sided silver octaflexagon, with 8 right triangles per face arranged in a square. After printing it out, cut out the rectangle. Fold it in half to make a square, then unfold. Cut along the two thick black lines on both triangles that say “path puzzle” on them. Fold back in half again and paste these halves together, being careful not to paste together the two triangles that say “path puzzle”. Once the paste has dried, cut along the other four thick black lines, sliding the scissors between the two “path puzzle” triangles. Pre-crease along the dashed lines. All the triangles have a thick border that’s red, blue, green or light purple. Alternate folding together adjacent triangles with a green border and adjacent triangles with a light purple border. When finished, tuck one flap under the other so the final two purple triangles are face to face. Fold the final blue triangle over and paste the blank sides together, making a square with blue on one side and red on the other. Fold it in half in various ways to prepare it for flexing. You should see four numbered paths on each side - 1, 3, 5 and 7 on the red side and 2, 4, 6 and 8 on the blue side. The goal is to see each path in its entirety, all 8 sections of the path forming a ring. You can only see one ring at a time. There are several ways to solve path 1. 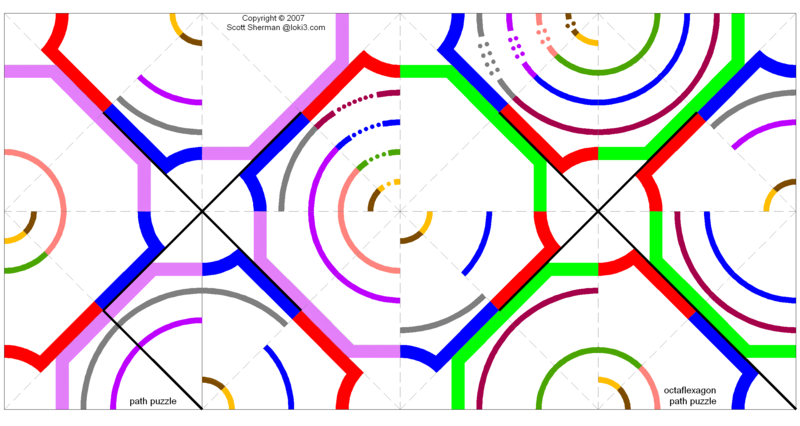 One option is to use the pinch flex as you would on a hexaflexagon. 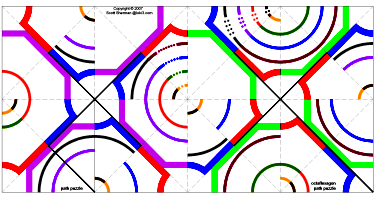 Pinch together each of the four pairs of triangles which share a red border. Push them all together in the middle and open it up from the center to reveal the light purple bordered square. When you turn it over, the square will now have a red border and the smallest ring will be complete.